I took the School Guidance and Counseling Praxis in January of 2009. The School Guidance and Counseling Praxis is a two-hour exam that consists of four content areas: Counseling and Guidance, Consulting, Coordinating, and Professional Issues. The exam questions are all multiple-choice. Approximately one-third of the exam is a listening exercise involving counselor and client interactions. To begin preparation for the School Guidance and Counseling Praxis, I recommend checking out the School Guidance and Counseling Praxis section on the ETS website. There are free test preparation materials including test at a glance material. There are many resources available you can purchase to study for the School Guidance and Counseling Praxis. There is a School Guidance and Counseling Praxis Study Guide eBook available for purchase through ETS that my colleagues and I found to be helpful. Their are many advantages of purchasing the School Guidance and Counseling Praxis Study Guide eBook. The main advantage of the School Guidance and Counseling Praxis Study Guide eBook is that it was developed by the company that created the test, which is an advantage because the questions and audio portions are representative of actual exam. Once you purchase the School Guidance and Counseling Praxis Study Guide eBook you can download it immediately, which means you can start using it immediately instead of waiting for delivery. It is important to note that the eBook requires Windows 2000, XP, Vista or 7 and Windows Media Player. If using a Mac, the eBook requires Parallels Desktop for Mac or a PC emulator, such as VirtualPC. (This was a disadvantage for me because I am a Mac user). Another resource that I would highly recommend is the book Encyclopedia of Counseling by Howard Rosenthal . Although Encyclopedia of Counseling by Howard Rosenthal is not geared specifically to School Counselors, it has a wealth of information on counseling topics. Encyclopedia of Counseling by Howard Rosenthal is also a great investment for individuals planning on taking the National Counselor Examination (NCE). School Guidance and Counseling Praxis score requirements for your state are available on ASCA's website. What resources have you used to study for the School Guidance and Counseling Praxis?Comment below, email me, tweet, or share on the School Counselor Blog Facebook Page! I have received many inquiries about my work with children of incarcerated parents. Parental Incarceration impacts millions of U.S. Children. According to the Family and Corrections Network, 7 million, or one in 10, U.S. children have a parent under some form of criminal justice supervision - in jail, prison, on probation, or on parole. There are unique problems and stressors created by parental incarceration. Children often face a form of imprisonment of their own when a parent is taken away. Children of incarcerated parents are often difficult to identify because of the shame and social stigma associated with incarceration. In spring of 2009 I ran groups for children of incarcerated parents. There are some really great resources available for learning about children of incarcerated parents. Many of the resources can be used in individual and group counseling. A website to start learning about children of incarcerated parents is The National Research Center on Children and Families of the Incarcerated (NRCCFI). I was trained by Ann Adalist-Estrin, the directer of the The National Research Center on Children and Families of the Incarcerated (NRCCFI). The NRCCFI website has fact sheets, links to resources, and training opportunities. I also recommend checking out the Bill of Rights for Children of Incarcerated Parents from San Francisco Children of Incarcerated Parents. A great book for counselors and educators to learn about issues associated with children of incarcerated parents is All Alone in the World: Children of the Incarcerated by Nell Bernstein. All Alone in the World: Children of the Incarcerated includes personal interviews with children and families. All Alone in the World: Children of the Incarcerated gives a voice to issues associated with incarceration. All Alone in the World: Children of the Incarcerated is a must read for anyone working with children. I use the book My Daddy Is in Jail: Story, Discussion Guide, and Small Group Activities for Grades K-5 in individual and group sessions with students. I keep my copy of My Daddy Is in Jail on display in my office. I often have students disclose they have a parent or family member in jail after seeing My Daddy Is in Jail on my shelf. Students really enjoy the book. One of the students I worked with particularly enjoyed drawing pictures and talking about them using prompts from the book. I also keep a copy of Visiting Day by Jacqueline Woodson on display. Visiting Day is about a little girl who goes to visit her dad in jail. What do you want to know about working with children of incarcerated parents? Do you have any favorite resources that you use for working with children of incarcerated parents? Comment below, email me, tweet, or share on the School Counselor Blog Facebook Page! I have shared these links in the sidebar on my blog, but I wanted to give readers more information about why these sites are so great! The American School Counselor Association (ASCA) is the national organization for school counselors. The site provides resources to members, articles, and information about the ASCA National Model. ASCA also has a blog, podcasts, and a social networking site called ASCA Scene. 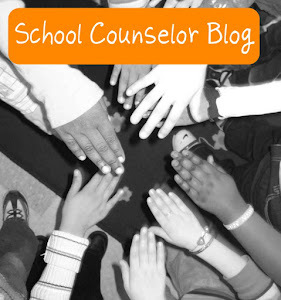 If you need more information the roles of a school counselor are, ASCA is the site for you! A lot of the features on this site are for members only. I highly recommend becoming a member of ASCA. To find out more about the benefits of joining the American School Counseling Association, click here. Are you an elementary school counselor? Do you have questions about school counseling? Do you need ideas for a lesson or topic? Would you really appreciate some advice on a situation? If you answered yes to any of those questions, The Elementary School Counselors Yahoo Group ListServ is for you! The Elementary School Counselors Yahoo Group ListServ allows members to ask questions and get answers fast. I frequently use the The Elementary School Counselors Yahoo Group ListServ to get ideas for lessons or find out about new resources. To join, follow the The Elementary School Counselors Yahoo Group ListServ link and click join this group. You will need a Yahoo Account to access The Elementary School Counselors Yahoo Group ListServ. Teaching Tolerance is a great website to get ideas, lesson plans, and resources. Educators can sign up for a free magazine and free classroom kits via mail. You can also sign up for free e-news from Teaching Tolerance. One of my favorite features of the Teaching Tolerance website is the searchable database of classroom activities. You can search by grade level or topic. Teaching Tolerance has received national attention for their Mix It Up program. Mix It Up encourages students to "mix it up" at lunch and sit with people the would not normally sit with. Mix It Up helps schools create a culture of tolerance and acceptance. You can download free kits with lessons to use for Mix It Up Day. What are your favorite websites to get school counseling resources? Comment below, email me, tweet, or share on the School Counselor Blog Facebook Page! 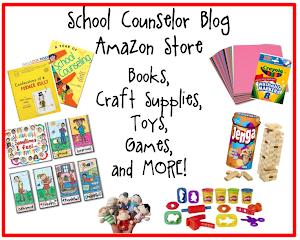 When I find cool websites and free resources, I like to share them on the School Counselor Blog. I came across the website, Really Good Stuff, today. 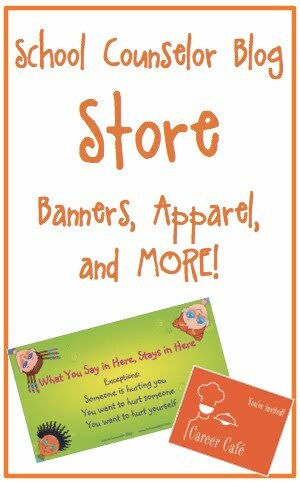 They have lots of great supplies for educators. They also have some really GREAT free resources on their website. There are free downloadable activity and study guides, fun and games, resource articles, question and answers, and a newsletter. There is also the teacher's weblounge where you can read blogs by educators! If you find a great website, comment below, email me, tweet, or share on the School Counselor Blog Facebook Page! Before Thanksgiving, I started a position as a school counselor for grades 4-8 . I am excited to work with the students, faculty, staff, and parents! I have lots of ideas and I can't wait to put my ideas into action! One of my main goals is to establish an environment of respect and peace with the grades I serve. I am starting an Anger Management and Friendship Skill group for fourth grade boys. I purchased the book Seeing Red: An Anger Management and Peacemaking Curriculum for Kids by Jennifer Simmonds. The book seems like a great resource. It has interactive activities at the end of each session. A member of the Yahoo Elementary School Counselor Listerv recommended the book. I will give updates about using the curriculum with my students. I am also looking forward to facilitating classroom lessons using The Peacemakers Violence Prevention Program created by Jeremy P. Shapiro. All of the counselors in my district facilitate the Peacemakers lessons to 6th grade. What curricula do you use to promote peace? Comment below, email me, tweet, or share on the School Counselor Blog Facebook Page! If you haven't checked out FableVision yet, I recommend that you check it out! FableVision has great resources for educators and great activities for students. 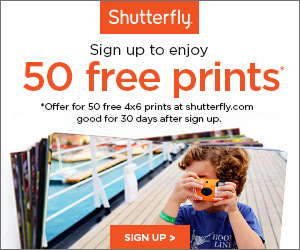 You can get Free ClipArt, Free Posters, and Play Free Interactive Games. Peter Reynold's materials are inspirational and fun! U Can Do! - "An ability focused website helping all people develop a 'can-do attitude' and approach to life...no matter what the obsticals." North Star - a site dedicated to teachers, families, students, life-long learners, and those brave enough to follow their dreams. SuperThinkers - FableVision teamed up with Verizon to create this interactive site filled with activities for kids. Featuring The Peetnik Mysteries, created by Peter H. Reynolds. This site can be viewed in English and Spanish! Where do you get free clip art? Comment below, email me, tweet, or share on the School Counselor Blog Facebook Page! I wanted to share a great link about teaching social skills utilizing social stories. A member of the Yahoo Elementary School Counselor Listserv shared this with the group. Click here to go to the link. It is a great resource for providing students with social stories about different situations. It has everything from starting at a new school to how to sit on the rug in kindergarten. What social story resources do you use? Comment below, email me, tweet, or share on the School Counselor Blog Facebook Page! For Literacy Day, I read The Paperbag Princess, by Robert Munsch , to 5th and 6th graders. The Paperbag Princess is a story about a princess who's castle is burnt down by a fire-breathing dragon. The dragon also takes the prince. The princess, Elizabeth, is infuriated. She goes on a mission to save the prince. She out-smarts the dragon and saves the prince. The Paperbag Princess shows a strong female character, which is very different than typical fairytales involving female royalty. The Paperbag Princess teaches many important lessons, including, respect, attributes of a strong character, and gives the message that it is what is on the inside that counts! What is your favorite book? Comment below, email me, tweet, or share on the School Counselor Blog Facebook Page! I read, The Secret that Olivia Told Me, by N. Joy , to fourth and fifth grade students to begin a dialogue about rumors. We talked about how a rumor is something that is spread from one person to another. A rumor can start out as something true, but people add information to it that makes it get bigger and bigger. We talked about what students should do if they hear a rumor. One student suggested that she would say, "I'm not interested," if someone tried to tell her a rumor. Other students suggested that they could tell an adult, tell the person spreading the rumor that it is not kind, or tell the person that the rumor is about so that they can get help from an adult. To give students a visual reminder about rumors, I used toothpaste. I had students volunteer to squeeze toothpaste out onto a paper plate until the tube was empty. I asked the students what the toothpaste was meant to represent. A student commented, "The toothpaste gets bigger and bigger just like a rumor." Each time the toothpaste was squeezed out, it represented someone spreading a rumor. When the tube was empty, I asked for another volunteer to put all of the toothpaste back in the tube. Students wanted to try to put the toothpaste back in, but we discussed how it would be impossible to get all of the toothpaste back in. One student shared, "the toothpaste is just like a rumor. Once [a rumor] is out you can't put it back in." What books or lessons do you use to teach students about rumors and gossip? Comment below, email me, tweet, or share on the School Counselor Blog Facebook Page! I worked with first through fourth graders to share a drug free message with the surrounding community. Students created brown paper grocery bags with a drug free message using a "bee" theme. I am going to take the bags back to the grocery store so that they can give the bags to customers for Red Ribbon Week. Check out the pictures of the students work! What other messages could you put on a paper grocery bag? Comment below, tweet, contact Danielle, or share on the School Counselor Blog Facebook Page! I facilitated a lesson with 4th graders that involved spaghetti, marshmallows, and cooperation! I divided the class into groups of three or four students. Each group received dry spaghetti noodles and a bowl of marshmallows. I instructed students that they would be making a tower with their group members. I told them that the group who had the highest tower at the end of ten minutes would get a prize from me. After the 10 minutes were up, I asked groups what they thought the point of the activity was. Students suggested that the activity was about "working together." I asked students what was difficult for them during this activity. They commented that it was difficult to work with others, it was frustrating when the spaghetti broke, and that it was hard to figure out how to make the towers stand with all of their group members helping at the same time. I asked the students what they had to do during this activity to work together. They commented that they had to share, ask each other for ideas, listen to their group members, explain things, show each other through examples, and be patient. The students really enjoyed this activity. 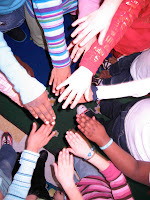 This lesson is a hands-on way to show the importance of cooperation. What creative lessons do you facilitate to teach students about cooperation? We are implementing a positive school wide behavior program that focuses on the three "B's": Be Safe, Be Responsible, and Be Respectful. We have been using "bees" to represent the three "B's" because of the play on words. I am currently teaching lessons about cooperation in grades K-4. I wanted to do a lesson that would involve art and teach first graders about cooperation. One of the art teachers gave me an idea of using finger print art . The students used a yellow marker to color their finger and then used their finger like a stamp to make bee bodies. The students did a great job. We talked about how bees cooperate with each other to make honey. I asked the students how first graders show cooperation. Some comments were: we share, we help each other, we ask each other for things, and we work together. Below are two finished pictures. What lessons do you use to teach students about cooperation? Comment below, email me, tweet, or share on the School Counselor Blog Facebook Page! The Anti-Bullying Machine: Turn Your Cruelty into KINDNESS! In honor of National Bullying Prevention Awareness Week, I have been facilitating classroom guidance lessons about bullying. I shared one of my favorite counseling books, Good-Bye Bully Machine, by Debbie Fox and Dr. Alan L. Beane , with second, third, and fourth grade students. Through the use of Good-Bye Bully Machine, we discussed what bullying is, how bullying feels, and what to do if you are bullied. The students really enjoy Good-Bye Bully Machine . It makes them think creatively about what makes a bullying problem at a school get bigger and how they can make a difference. I have also utilized the free interactive facilitators guide that is available to use with this book from Free Spirit Publishing. The facilitators guide has great ideas and handouts. To make the bulletin board, we enlisted the help of students in an after-school program that I run. The students had a blast making the Anti-Bullying Machine. To make the cogs, the students traced circle patters and a pattern that I created. After tracing their "cogs," the students cut out their "cog." They used crayola construction paper crayons to outline the cogs in a contrasting color. The students brainstormed cruel words and put-downs that they could put in mean end of the Anti-Bullying Machine and kind words that would come out the kind end. We used rectangle pieces of construction paper to make the Anti-Bullying Machine complete. The students loved helping with the bulletin board. It was a huge success! What creative bulletin boards have you made about bullying? Comment below, email me, tweet, or share on the School Counselor Blog Facebook Page! This is the extension of the The Colors of Us Revisited lesson using the book The Colors of Us by Karen Katz. At the beginning of the next class, We listed to the Jack Johnson song "My Own Two Hands. " We spoke about things that the students could do with their own two hands to change the world. After listening to "My Own Two Hands," the students were instructed to use the sheet of their own unique color to trace their hand print. After they traced their hands, they cut them out. The students were instructed to decorate their hands using crayola construction paper crayons. They could either draw pictures on their hands of their favorite things or make a design. The students then pasted their hands to a circle with a picture of the world in the center. I went around to each student and asked what they could do to change the world with their own two hands. We used the suggestions that the students came up with as a background for the bulletin board. Some examples were: "With my own two hands I can... be gentle, draw, help set the table, create art, give my pets love, clean up the Earth, and help others." You can preview to the Jack Johnson song at the bottom of this post. What creative lessons have you facilitated about diversity and tolerance? Comment below, email me, tweet, or share on the School Counselor Blog Facebook Page!